Cover photo-Happy Holidays from everyone at Carnival Magazine. Cover photo-Rail cars and flat cars from various carnivals. (Photos courtesy of Bill Hall). * Reithoffer's Jack Stoorza: "Know Your Clientele"
Cover photo-Nik Wallenda walks the high wire at the Erie County Fair. Also, James Strates (second from the left) arrives in Hamburg, N.Y., for the Erie fair. (Photos by Tom Wolf Imaging). Cover photo-Fair scenes from all around the United States (Wades Shows' Rainbow ride photo by Rich Schmiedecke; top left photo by Chris Hurley). Cover photo-The independent midway at the San Diego County Fair, with the Pacific Ocean in the background. Photo by Christian Vega. * Midway Personality: Betty Gillette -- "It's All About Family"
* Those Were the Days: Patrick Edward Reithoffer, Jr.
Cover Photo-North American Midway Entertainment at Eustis, Florida, photo by Rich Schmiedecke. Dell and Travers Shows: "Mile Long Pleasure Trail"
Plus our regular monthly features: Direct from the Lots, Midway Talk, Now Booking, Carnival Transport, Concession Stands, Marketplace for Showmen and Classifieds. 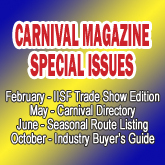 Carnival Magazine is a monthly publication dedicated to providing the latest carnival business news and preserving the cultural history of the industry. Visit our subscriptions page and sign-up today. Cover Photo- 2014 IISF Trade Show, photos by Jeff Berard. Olson Shows: "World's Greatest Midway"
Plus our regular monthly features: Direct from the Lots, Midway Talk, Now Booking, Concession Stands, Marketplace for Showmen and Classifieds. Cover Photo- Christiansen Amusements midway, photo by Christian Vega. Do You Remember Vintage Midways? Cover Photo- Kraft Foods sponsored Giant Wheel owned by Wade Shows. Do You Remember Vintage Rides? Cover Photo- Powers Great American Midways, photo by R.D. Thomas.